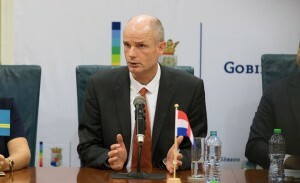 WILLEMSTAD - The government of Curaçao deeply regrets the statements of the Minister of Foreign Affairs, and in that capacity also Kingdom Minister, Mr. Blok, on multicultural societies. The government absolutely does not agree with these statements that most certainly also touch the core of the multicultural Curaçao society. “It is precisely our diversity that makes us powerful. As Curaçao we are proud of the fact that we are a society made up of people from all parts of the world, living side by side in peace and harmony, despite the different ethnic and religious backgrounds. Our 'unity in diversity' is above all cherished in Curaçao and has recently been celebrated on our day of the flag (Dia di bandera),” says the government in a press release. Lastly, the government of Curaçao wishes to emphasize that Minister Blok also represents four multiethnic, multireligious and multicultural countries in the Kingdom and represents them as such in their foreign relations. The expressions of Minister Blok are not representative of the reality in the Caribbean part of the Kingdom. On the contrary.